Used in the treatment of Diarrhea, Stomach gas or Flatulence, Irritable Bowel Syndrome (IBS), etc. Pack Size : The strip contains 10 capsules. Gut-Renew Capsule contains good bacteria which help to protect from harmful bacteria and fungi. 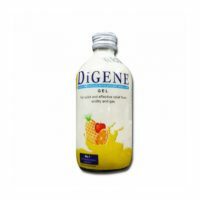 Stimulates the immune system, decreases serum cholesterol, decreases the diarrheal incidence, and controls infections. 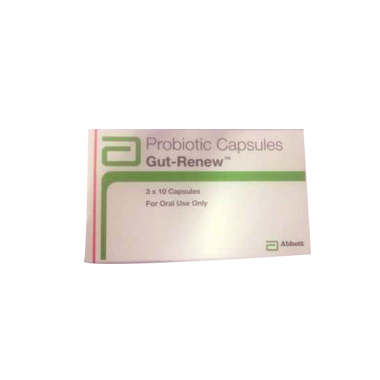 Gut-Renew Capsules contains various bacteria as active ingredients. It include Bifidobacterium bifidum, Lactobacillus acidophilus, Lactobacillus casei, Lactobacillus plantarum, Lactobacillus reuteri, Lactobacillus rhamnosus, and Saccharomyces boulardii . – Useful to treat the uncomfortable symptoms of bloating, gas or flatulence. Take one Gut-Renew Capsule twice daily or as directed by the physician. Diarrhea, Stomach gas or Flatulence, Irritable Bowel Syndrome (IBS) etc.